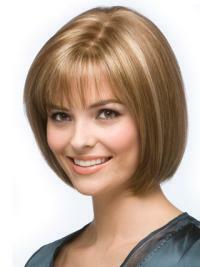 Length: 9.5"; Fringe: 4"; Nape: 4"
It is a sleek, smooth bob with razor cut edges for a more distinctive finish. It's now available in a range of hybrant colours for added kick! 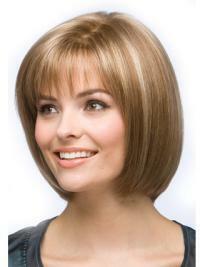 We continues to offer customers the highest quality wigs that are both unique and stylish. I was very pleased with with this wigI was very pleased with with this wig. It fit snug and secure without feeling tight and uncomfortable. Great styleReceived many compliments. My husband said I look beautiful! Cute & EasyHappy to find a simple style for my 93 yr old mom. Bought 2 with different shades of auburn. Unfortunately her caretakers are not great with them, but such an improvement. The perfect wig!Love this wig. I have been told it makes me look years younger! The length is not too short and not too long - it's perfect! I will upload a picture soon. So natural looking!This is the most beautiful wig. I have received numerous compliments about who does my hair. It is so natural looking right out of the box. Thank you so much. I will be ordering more in different colors. Love love love! !This wig is perfect right out of the box. No bang trim or thinning needed. I'm at a loss for why this wig isn't a best seller - it should be!